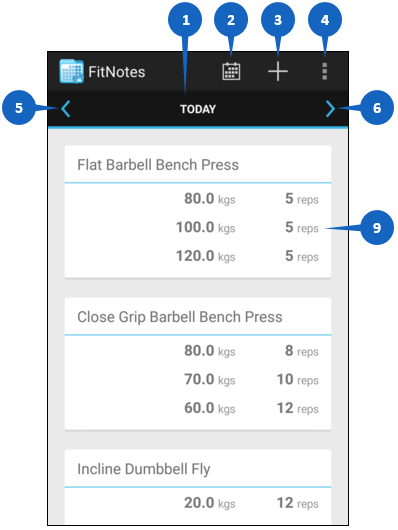 FitNotes allows you to quickly and easily record your workouts whether you like the flexibility of tracking exercises on-the-fly or prefer a more structured approach by following a pre-defined Workout Routine. The Home Screen is displayed when you launch the app and it's the central hub for accessing all of your training data. If you've ever logged your workouts in a paper notebook then it should hopefully feel immediately familiar. 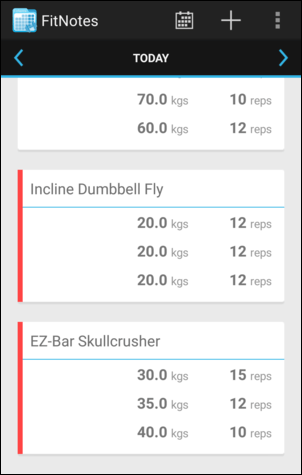 Each workout is displayed on a separate page (with today's workout displayed by default) and you can flip between workouts by swiping left and right or by using the and buttons. The date of the workout currently being viewed. You can tap this area to return to 'Today' at any time. The Calendar highlights the dates that you trained and allows you to easily revisit past workouts. Select an exercise to add to the current workout. The overflow menu allows you to navigate to other parts of the app including the Settings and Body Tracker. It also allows you to Copy a Workout, Comment a Workout, and Share a Workout. Jump to the previous day's workout (or swipe right). Jump to the following day's workout (or swipe left). If you haven't yet created a workout for the selected date then tap here to choose your first exercise (see Log a Workout). If you would like to repeat a workout completed previously then you can copy it and make any adjustments you need (see Copy a Workout). Once you have recorded sets for an exercise they will be shown here. Tap the exercise to return to the Training Screen. 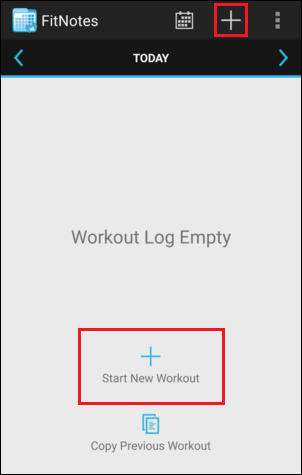 Tap the button on the Home Screen (or select Start New Workout if no exercises have yet been logged) and the Exercise List will be displayed. 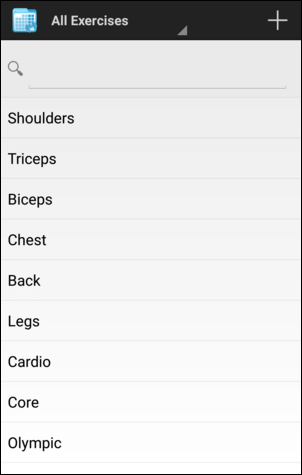 Tap a category (muscle group) to view the exercises it contains or use the search box above the list to find a specific exercise. If the exercise you're looking for is not included by default then you can create it by tapping the button. Once you have selected an exercise you will be taken to the Training Screen. 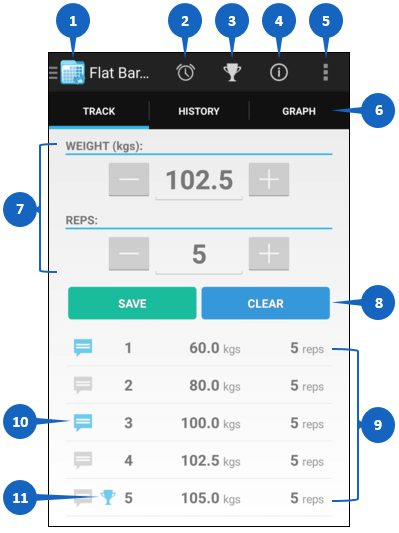 The Training Screen provides everything you need to not only track your current workout but also to review and analyze your past performance and progress. The Navigation Panel allows you to quickly jump to another exercise in your workout. The Rest Timer allows you to countdown the rest period in between sets and alerts you when the time is up. View your Personal Records, Statistics and Goals for the current exercise. 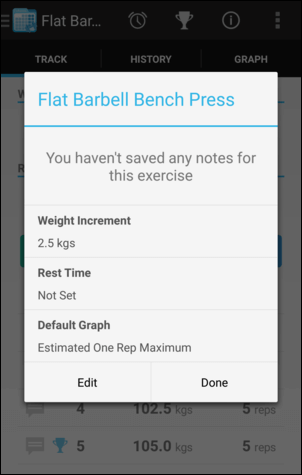 The Exercise Notes screen allows you to save notes for the current exercise as well as specify some default options. The overflow menu provides access to advanced workout tools: 1RM Calculator, Set Calculator and Plate Calculator. In addition to tracking your current sets, the tabs at the top of the Training Screen allow you to quickly view your full Training History for this exercise as well as review your Progress Graphs. Enter the values that you want to record for your next set. The fields displayed here will be some combination of Weight, Reps, Distance, and Time and will be dependent upon the type of exercise that is currently selected. Create a new set by tapping the Save button or select an existing set in the Set List to Update or Delete it. The list of sets that you have recorded for the exercise in the current workout. Tap a set in this list to Update or Delete it. You can re-order this list by pressing-and-holding a set and then dragging it to a new position. Tap the comment icon to add a comment or view an existing comment against a set. The trophy icon indicates that this set contains the largest amount of weight lifted for this exercise and this number of reps. Tap the icon to view your personal record history for this rep-count or visit the Personal Records page. When you initially open the Training Screen for an exercise then the Set List will be empty. If you have logged sets for this exercise previously then the Set Fields (Weight/Reps/Distance/Time) will be automatically populated with the values of the first set from the last workout. Tap a Set Field to enter a value using the keyboard or use the and buttons to increase or decrease the value of the field respectively. You can alter the increment value from the Exercise Notes screen. Tap the Save button to create a new set. This allows you to make minor adjustments to any set as necessary and to record comments which are specific to an individual set. You can tap a set in the Set List to select it. The set will become highlighted, the set's values will be displayed in the Set Fields, and the Save and Clear action buttons will be replaced with Update and Delete. You can make any necessary adjustments to the field values and then hit Update to save the changes. Tap Delete to remove this set from the workout. Note that this will also delete any comments recorded against the set. If you selected a set by mistake then you can tap it again in the Set List to deselect it. It is also possible to edit multiple sets at once, or edit sets from a past workout, from the Training History. Tap the icon to the left of a set to make a note of any extra details that you would like to record about the set. This could include the amount of rest taken before the set, a reminder that a spotter assisted with the last rep, or anything else that you think might be useful. The icon will turn blue to indicate that there is a comment stored against the set and it will be visible when reviewing your Training History in the future. Tap the icon to view the comment or edit/delete it. 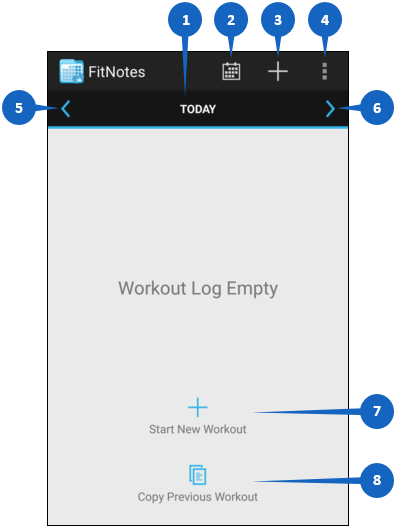 The Navigation Panel can be opened by tapping the FitNotes logo at the top-left of the Training Screen or by swiping in from the left edge. The exercises that you have already logged in this workout will be displayed along with the number of sets recorded for each. Tap an exercise in the list to select it. This will reload the Training Screen for that exercise allowing you to review the sets that have already been logged or create a new set. You can re-order the exercises in your workout by pressing-and-holding an exercise in the list and then dragging it to a new position. Tap Add Exercise to select a new exercise to add to this workout. 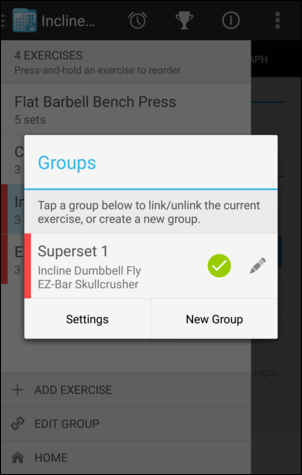 Tap Add To Group if you would like the exercise to belong to a Superset. Tap Home to quickly return to the Home Screen. It is possible to group exercises in a workout together if they are to be performed as part of a superset or circuit. When you create a set for an exercise in a group (or mark a set as complete when the Mark Sets Complete option is enabled) then FitNotes will automatically jump you to the next exercise in the group to ensure that you can log your sets as quickly as possible. There is a video here which demonstrates how to configure a group, or you can follow the steps detailed below. To begin, select the first exercise that you would like to be included in the group by following the steps in Log a Workout above. Open the Navigation Panel by swiping in from the left edge of the screen and then tap Add To Group. 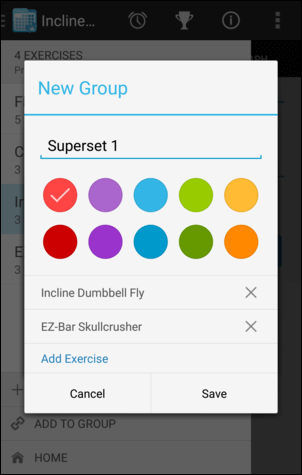 The workout doesn't contain any groups yet so tap New Group to create one. A default name will be generated for the group but you can change this if needed. You can also select a colour for the group which will be displayed alongside the exercises in the workout. 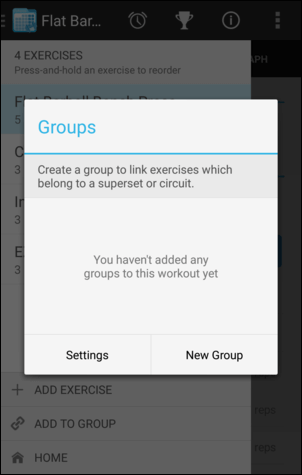 Your current exercise will be added to the group automatically. Tap Add Exercise to select the other exercises that you would like the group to include and then hit Save. Once the group has been created you can begin logging your sets. As mentioned above, once you create a set for the first exercise in the group you will automatically be taken to the next exercise to log your next set. Once you have created a set for each exercise in the group then you will be returned to the first set to begin the second round of the superset/circuit. A coloured bar will be displayed alongside the exercises when viewing your workout to indicate that they belong to the same group. If you would like to remove an exercise from a group, edit the group, or delete the group entirely, then you can do so by opening the Navigation Panel and tapping Add To Group (or Edit Group if the current exercise belongs to a group). Tap the button next to a group to edit it. 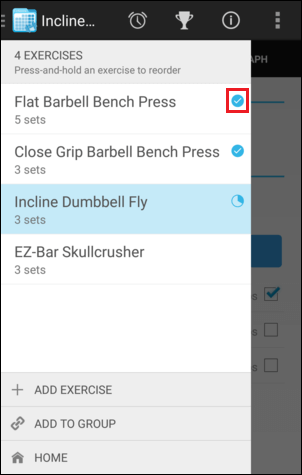 Enable the Mark Sets Complete option in the Settings menu and a checkbox will be displayed along each set in your workout. You can tap the checkbox to indicate that the set has been completed in order to easily keep track of your progress through the workout, which can be useful if you create the workout in advance (e.g. when copying an existing workout or using a Routine). Once you have completed all of the sets for an exercise you will automatically be prompted to jump to the next exercise in the workout. 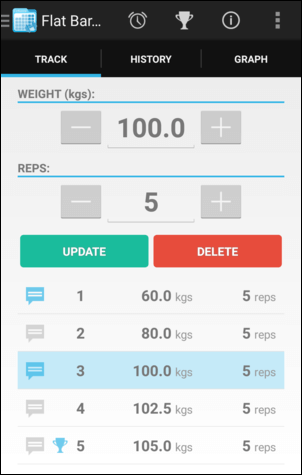 You can see an overview of your progress through the workout using the progress indicators displayed alongside exercises in the Navigation Panel and on the Home Screen. 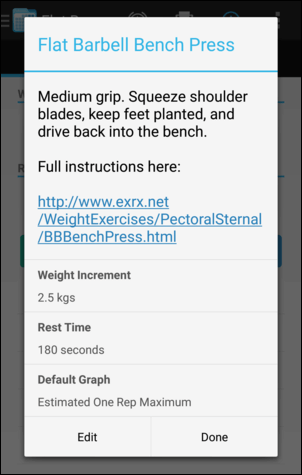 Tap the button on the Training Screen to open the Exercise Notes. You can use these notes to store any information about the exercise that you would like to be able to quickly reference in each workout. This could include instructions for completing the exercise, tips about form, machine settings, or anything else you can think of. It's also possible to enter a website URL if you would like to link to an online resource. Weight Increment: Set the increment value used by the and buttons. Only applicable to weight-based exercises. Rest Time: Specify the default rest period that will be populated when using the Rest Timer for this exercise. Default Graph: Select the Progress Graph that you would like to be displayed by default for this exercise. You can record a comment against a workout to remind yourself of any important details about the workout in the future. Tap the button on the Home Screen and select Comment Workout. The comment will then be displayed above the workout when viewing it on the Home Screen or from the Calendar. You can generate a readable, text-based representation of your workout which you can share to social media, email to your personal trainer, or just store for your own records. Tap the button on the Home Screen and select Share Workout. 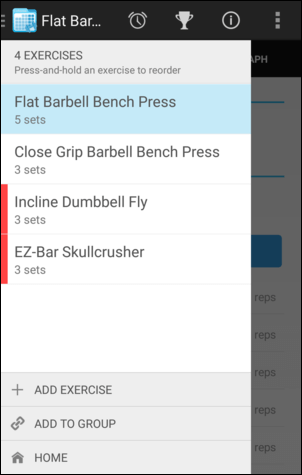 You can select the exercises and sets that you want to be included by tapping the checkboxes. Tap Options to enable additional items that you would like to be included such as 'Total Workout Volume' and 'Total Sets'. Tap Share and select the app you want to share to. You can base your current workout on one created previously to save time if you plan on completing the same selection of exercises this time around. If you have not yet recorded any sets in the current workout then tap Copy Previous Workout on the Home Screen. Otherwise tap the button and select Copy Workout. The Calendar will be displayed allowing you to select the date of the workout that you would like to copy. Tap the date of the workout that you would like to copy and the exercises and sets belonging to that workout will be displayed. 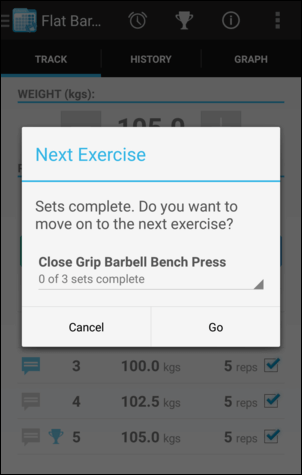 If you do not want an exercise or set to be included then tap the checkbox to deselect it. You can also make any necessary adjustments to the sets before the workout is copied by tapping Edit. Tap Copy to add the selected sets to your workout. You can move a workout (or selected parts of a workout) to a different date if needed. Navigate to the workout that you want to move by swiping left/right on the Home Screen, using the and buttons, or by selecting a date from the Calendar. Tap the button on the Home Screen, select Copy Workout, and then hit Move This Workout. In addition to deleting individual sets (see Edit/Delete Sets) it is also possible to delete all sets belonging to an exercise, or a selection of exercises, within a workout. Press-and-hold an exercise on the Home Screen until it becomes selected. Tap any additional exercises you would like to delete or tap the button and hit Select All. Press the button to remove the selected exercises from the workout. It is possible to re-order the exercies in a workout from the Navigation Panel as mentioned above but this can also be done from the Home Screen. Press-and-hold the icon to the right of the exercise name and drag it to a new position.